Scientists have found it is possible to mend a broken heart. US researchers studied 70 patients with "broken heart syndrome", a recognised condition linked to stressful or emotional events. All these patients recovered, most after being given aspirin or heart drugs, even though 20% were deemed critically ill. The American Journal of Cardiology study says the condition is probably caused by a surge in stress hormones. 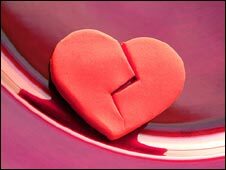 Broken heart syndrome, known medically as Takotsubo cardiomyopathy, was first described by Japanese researchers in the early 1990s. Even though symptoms mimic those of a heart attack such as chest pain and shortness of breath, broken heart syndrome does appear to be temporary and completely reversible - if treated quickly. The patients studied by the researchers from two hospitals in Providence, Rhode Island were diagnosed with broken heart syndrome between July 2004 and April 2008. Around 67% of patients had been exposed to some sort of physical or emotional distress - such as bad news about a family member, a domestic argument, severe physical illness or a car accident - just before the onset of symptoms. Six patients presented with heart-induced shock and three had abnormal heart rhythms which required emergency treatment. Two-thirds of the patients - almost all post-menopausal women - had experienced a very stressful physical or emotional event just before arriving at the hospital with heart attack-like symptoms. Overall, the majority of those in the registry were prescribed aspirin or heart drugs such as, beta blockers, ACE inhibitors and statins while in hospital. Even though a fifth were were critically ill and required emergency treatment to keep them alive, all the patients survived the first 48 hours and experienced a full recovery. The researchers also discovered that, unlike heart attacks which tend to occur in winter, broken heart syndrome cases tend to occur in the spring and summer months. Dr Richard Regnante from the Miriam Hospital, who led the research, said this seasonal pattern could help understand the condition. "Some believe it is simply a form of a heart attack that 'aborts' itself early and therefore doesn't leave any permanent heart muscle damage. "Others say that the syndrome has nothing to do with the coronary arteries and is simply a problem with the heart muscle. "Since the seasonal pattern of broken heart syndrome that we observed is opposite of what it seen with heart attack patients, our findings suggest - but certainly do not prove - the latter theory may be correct." He added that the study could help heart specialists and A&E doctors manage patients with the condition. "Although there is much we're still learning about broken heart syndrome, we do know that it is rarely fatal as long as patients are fully supported with medications, respirators and other critical devices in the first 48 hours." Dr Regnante and his team are now recruiting patients with broken heart syndrome for a new study which will use ultrasound images to look at whether the condition causes internal damage to the heart. June Davison, a spokeswoman for the British Heart Foundation, said: "There does seem to be an association between this condition and a very stressful event. "But not enough people have been affected to provide hard evidence of what happens and what actually causes it. "However people do seem to make a full recovery."